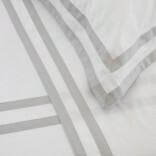 Formentera is our European made 280 thread count 100% Egyptian cotton sateen collection. It has a border of double applique band of sateen which frames each product with a splash of colour. A classic design for all ages, Formentera´s fine sateen weave is a delight to wake up in.